Hannah Frenkel, MPH from the University of Washington compared injury & illness rates at indoor & outdoor preschools. The result: children learning & playing outdoors is just as safe as learning and playing inside. Despite the cold weather, and increased risk taking by children that happens in an outdoor classroom, students have the same rate of injury and illness. Or read the introduction below. This study investigated the incidence of illness and injury at nature preschools compared to conventional preschools. For 14 weeks, teachers at five nature and four conventional preschools logged the number of child absences due to illness and the number of injuries that occurred at preschool. This study found no difference in illness incidence by preschool type and no serious injuries during the course of the study. Girls at nature preschools had a higher incidence of minor injury compared to girls at conventional preschools. For boys, no significant differences in minor injuries by type of preschool were noted. Overall, the study found that nature preschools are a healthy and safe child care model. Time spent outdoors in natural environments has been shown to yield physical, cognitive, and emotional benefits for young children. Outdoor environments promote physical activity and active play that are associated with healthy gross motor development . Motor development is supported both through the physical exertion and physical challenges of playing on the varied features and uneven surfaces typical of the natural environment [2, 3]. Outdoor physical activity is also associated with other physical health benefits for children, such as lower obesity, decreased near-sightedness and improved Vitamin D levels, necessary for healthy bone development [4-7]. In addition to physical health benefits, exposure to nature and outdoor play have been shown to make positive contributions to children’s social and emotional development, including increased cooperation, creativity, self-discipline and lowered levels of stress [8-11]. Children also benefit cognitively from time in nature through improved problem-solving abilities, increased attention, and reduced symptoms of attention-deficit hyperactivity disorder [9, 12-14]. While the evidence regarding the many benefits of children’s outdoor exposure is growing, outdoor play opportunities for preschoolers residing in urban areas are limited. The American Academy of Pediatrics recommends that preschool age children get 60-90 minutes of outdoor time each day . A study of Washington State’s child care programs found that most centers provided less than the recommended amount of daily outdoor time for young children . Another study found that conventional child-care centers provided an average of only 33 minutes of outdoor active play per day . Furthermore, in a nationally representative U.S. sample, less than half of preschool age children were reported to play outdoors with their parents on a daily basis . As parents and educators become increasingly aware of the benefits of time spent outdoors, nature preschools have been gaining in popularity. In nature preschools, exposure to nature is the organizing principle of the program, and both early childhood education and environmental education are emphasized . The nature preschool model is popular in Europe, particularly in Scandinavia and Germany. The German government recognized nature preschools (also called Waldkindergartens or forest kindergartens) as a legitimate form of child care in the 1990’s and started to offer subsidies for children to attend, which dramatically increased the number of nature preschools to over 1,000 by 2014 . The movement in the U.S. has been lagging behind Europe, but has accelerated in recent years. Since its inception in 2014, the Natural Start Alliance, a coalition dedicated to connecting young children to nature, has brought together over 230 nature preschools across the U.S. . In May of 2017 the first bill to license nature preschools in the U.S. was passed in Washington State . 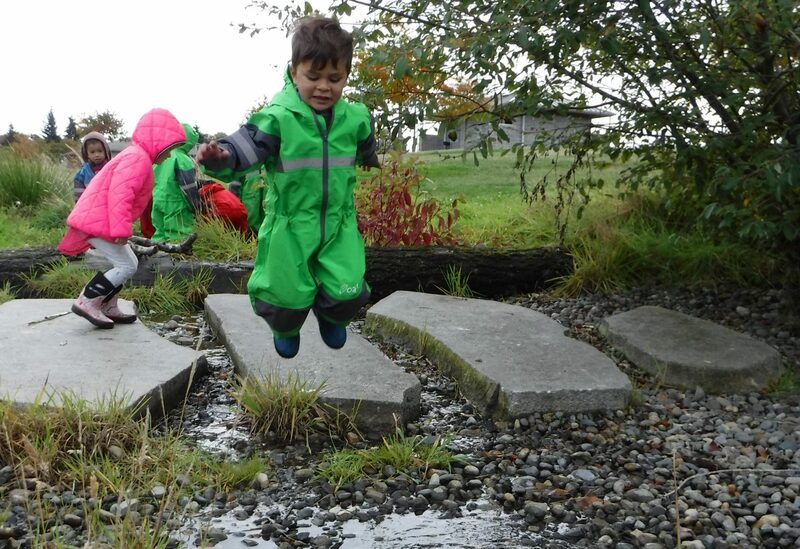 This historic piece of legislation demonstrates the strong interest of educators, parents, and policy makers in expanding the nature preschool model in the Pacific Northwest, a pioneering step for the licensing of nature preschools across the country. While interest continues to mount for this alternative model of early childhood education, little research has focused on the health and safety implications for children of spending the preschool day out of doors. To date, there is no research regarding the incidence of illness among children at fully outdoor nature preschools compared to conventional preschools where most of the children’s time is spent indoors. Two studies, one conducted in Denmark and one in Sweden, evaluated the effects of outdoor time at preschool on the incidence of illness and reported mixed results. The Danish study found no association between outdoor time and risk of illness, and the Swedish study found that exposure to outdoor time was associated with decreased illness incidence [22, 23]. A study conducted in Norway compared illnesses between children at outdoor and conventional preschools; however, preschools were classified as outdoor if they spent a minimum of 3.5 hours outside per day. This method of categorization of outdoor preschools included schools where children spent some of their day indoors . No difference was found in the incidence of illness between the outdoor and conventional preschools. However, since contagious illnesses are often spread via contact with shared surfaces, even limited time indoors could increase the incidence of illness. These studies do not directly address the question of whether health outcomes of children who attend outdoor preschools differ from health outcomes of children who attend indoor preschools. Nature preschools could plausibly demonstrate either a lower or a higher incidence of illness than conventional preschools. Several considerations suggest a decreased risk of infectious disease. First, nature preschools may present fewer shared surfaces to touch and spread infectious agents. Additionally, children at nature preschools may be less likely to inhale airborne viruses since they spend all day outdoors in fresh air . Third, there is evidence that natural exposures may enhance immune activity [26-28]. On the other hand, outdoor exposure may confer an increased risk. Some research has shown that exposure to cold temperatures and low humidity, as well as changes in temperature and humidity, are associated with an increased risk of respiratory illnesses . Children attending nature and conventional preschools may also differ in their risk of injury. More than half of injuries at preschools occur outdoors, with most medically attended injuries occurring on playground equipment [30-32]. Children at nature preschools have greater opportunity to be physically active than children at conventional preschools who spend most of their preschool day indoors. Increased physical activity plus a potentially less predictable play environment may increase the risk of injuries for children at nature preschools. On the other hand, children at nature preschools spend less time on playground equipment compared to children at conventional preschools, which could decrease their risk of serious injury. Furthermore, engaging in outdoor play and risk-taking behaviors provides children with physical and cognitive challenges that improve their problem-solving abilities and can help them push their limits [2, 33-37]. Outdoor play has also been shown to help improve children’s motor skill development, which may decrease their injuries as they become more physically confident and competent [2, 37]. and injury would differ for children enrolled in nature preschools compared to children attending conventional preschools. The hypothesized difference could be in the direction of either higher or lower incidence of illness and injury in outdoor preschool settings. A secondary aim of the study was to determine the feasibility of utilizing a standardized tool to collect illness and injury data at preschools. Study findings will serve as a platform for larger scale research efforts to evaluate the health effects of outdoor preschools. Additionally, the study will assist educators, researchers, and policy makers in considering methods for standardizing the collection of health outcome data in preschool settings.